The Indian Ocean is a destination known for its luxurious resorts with lavish service but there are some resorts which are seeking to redress the balance between comfort and climate change; success and sustainability by tackling issues such as food waste and plastic and attempting to give back to the communities and the wildlife that live around them. From within the innocuous looking open-sided thatched shack, plonked aside some fields, the hero of this story – the chef – duly delivers a traditional, multi-course culinary masterclass. Using local ingredients, he conjures up a procession of implausibly tasty creations over a stove, as I struggle to control my rumbling belly. I devour dish after dish with Greg Wallace-style zeal and, had I not been so replete, by the time it came to leave I think I’d have wept Sri Lankan curry tears. The experience, provided by Village Rider and booked via Red Dot Tours, began with a small convoy of tuk tuks weaving out of the city’s melee before we careered down a muddy path towards a foodie nirvana of true spicy decadence. Sri Lanka’s responsible tourism bow has many strings, from the cultural treasures of Kandi and Sigiriya to its emblematic wildlife such as elephants, leopard and the whale watching off Trincomalee and Mirissa. I’ve seen it all, yet for some reason my mind always wanders back to that belt-stretching traditional feast I presided over in the countryside outside Galle. As authentic culinary tours have gained traction in recent years the Indian Ocean’s feted high-end resorts have adopted a more sustainable approach to sourcing and disposing of foodstuffs. Take Kuramathi in the Maldives, where many ingredients used in its restaurants are grown on-site, enriched by fertilizers from composters fuelled on food waste. At Mauritian resorts such as Maradiva Villas & Resort and Shanti Maurice guests can learn about eating sustainably while touring their organic gardens. Others are doctoring menus, such as Six Senses Laamu, which stopped serving shrimp and prawn in September due to their heavy environmental footprint. Water is another focus. Resorts such as Hilton at its Labriz Resort in The Seychelles, and Atmosphere at its Maldives properties, now give out reusable glass bottles of water from desalination or water purification systems. Marine conservation is a major concern. In the Seychelles the government recently pledged to increase its protected waters from 0.04 to 30% by 2020, and in October issued a 10-year ‘blue bond’ on finance markets to help fund fisheries projects. With its low-lying islands no nation is exposed to rising sea levels as the Maldives. A major focus is protecting and rehabilitating its resorts’ famed house reefs whose coral has suffered from ‘bleaching’ due to rising ocean temperatures. Coral cultivation schemes are now common. At Niyama Private Islands the coral nurseries are accessible from the beach and guests can snorkel them with or without the resort’s marine biologist. And last summer saw Summer Island submerge an artificial, 3-D Printed Reef in its lagoon to promote growth. Many resorts, including Niyama, feature Coral Adoption programmes. Kandima Maldives offers guests online updates as their adopted coral grows on artificial frames in its lagoon. Other initiatives include air conditioning via a waste generator. Projects at Gili Lankanfushi, with its dedicated marine biology shack, wet lab and two full-time marine biologists, range from seagrass meadow planting to Manta Ray and Turtle conservation. Operators taking a group-wide sustainable approach include Banyan Tree, with its Stay for Good programme. Another strong eco-friendly player is Blue Safari Seychelles group whose Alphonse Island is now totally reliant on solar power. Both Four Seasons Seychelles resorts offer marine education programmes, in partnership with NGO WiseOceans. Desroches Island, which opened in March, features a marine Discovery Centre and guests can go on a guided snorkel with a marine educator. Land-based programmes include North Island’s Noah’s Ark project, aimed at repopulating the island’s indigenous Seychellois wildlife. Lesser-visited areas gaining traction include Mozambique where luxury, sustainable options number andBeyond's Benguerra Island and Vamizi Island, sister properties to andBeyond Mnemba Island off Zanzibar. Local trade-friendly operators featuring biodiverse Madagascar, whose top resort spots include Nosy Be and the Mitsio Archipelago, include local operator IC Tours and Rainbow Tours which offer everything from small group journeys to stays at Miavana Private Island. Flights: Air Madagascar new’s domestic airline, Tsaradia, services 10 domestic destinations out of the island’s capital Antananarivo. Ethiopian Airlines now flies direct to Nosey Be from Addis Ababa, from where it now connects to Manchester (from December 11), as well as Heathrow. DMCs: Khiri Travel unveiled a new trade-facing website in November featuring sustainable holidays and experiences in Sri Lanka and the Maldives. “Responsible travel practices are at the core of our travel experiences and our new website shows this,” said founder Willem Niemeijer. Representation: A private consortium of Tanzanian operators, TANTOO, recently signed up Kamageo to represent them in the UK trade. Indian Ocean options include The Zanzibar Collection. Hotels & Resorts: In November Mauritius’ Veranda Tamarin reopened following an extensive six-month renovation. Also just open is SALT’s first property. Set on the island’s east coast the 59-room SALT of Palmar promises a ‘humanistic approach to hospitality for the culturally curious traveller’. Programmes include Skill Swap where guests exchange their time and talents with local artisans. it will open its SALT Farm in March, partnering with a local NGO to combat food waste. Blue Safari Seychelles opened its latest property, Cosmoledo Eco Camp, on Wizard Island in the remote atoll of Cosmoledo in November. The ‘eco pod’ rooms at the boutique, eight room eco-luxe property are housed in shipping containers. A Club Med will open in Seychelles in 2020. Options in Sri Lanka include Harding Boutique Hotels’ six-suite luxury boutique hotel Ahangama, opening autumn 2019 in Ahangama. New Maldives properties promising sustainable approaches include Westin Maldives Miriandhoo Resort and Mӧvenpick Resort Kuredhivaru Maldives in the Noonu Atoll, featuring 105 villas and suites (72 overwater). December saw the opening of JOALI Maldives on Muravandhoo island. The ‘eco-luxe’ charmer actively encourages guests to offset their carbon footprint by supporting its local projects. The Residence Maldives at Dhigurah in Gaafu Alifu Atoll opens this month next to sister property The Residence Maldives at Falhumaafushi. Future openings include Hard Rock Hotel Maldives, opening in March, and the 200-guestroom Saii Lagoon Maldives, Curio Collection by Hilton, opening in April. 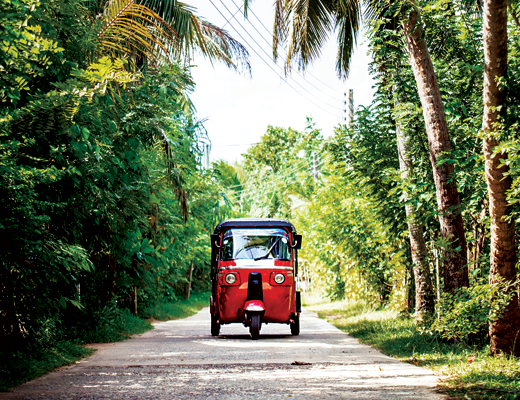 Meet the village people: The TUI Collection of responsible tours features an Agro Village Traditions excursion sampling village life at Sri Lanka’s Agro Park Millaniya, backed by a visit to a Buddhist temple and a countryside tuk-tuk ride. Adults from £52.64. The right ingredients: on Shangri-La Villingili Resort & Spa’s Farm to Plate dining experience, guests learn about sustainable growing whilst touring the chef’s garden and farms of local suppliers before enjoying a ‘handline’ fishing trip. Ingredients are then cooked back at the resort. $725 for two people. Sail away: Turn a boat excursion into a holiday with G Adventures’ Maldives Island Hopping eight-day round trip from Hulhumale (priced from £649). Alternatively, the operator’s Sailing Sri Lanka – East Coast itinerary is a seven-day round trip from Negombo, from £1,139. Head inland: Mauritian DMC Mautorco’s Wild South tour explores the stunning Black River Gorges National Park and takes in everything from waterfalls, trails and dormant volcanoes to a rum distillery tour. andBeyond’s new six-day Oceans without Borders Small Group Journey, privately guided by a marine biologist, teaches clients all about the operator’s sustainable tourism efforts. The price, from $10,775pp, includes a $1,500 Ocean Without Borders donation, a villa at andBeyond Vamizi Lodge, Mozambique, and return flights from Dar es Salaam to Vamizi. Rainbow Tours offers a nine-day Cycle Across Réunion guided tour from £3,550pp, including accommodation, transfers and flights from the UK.